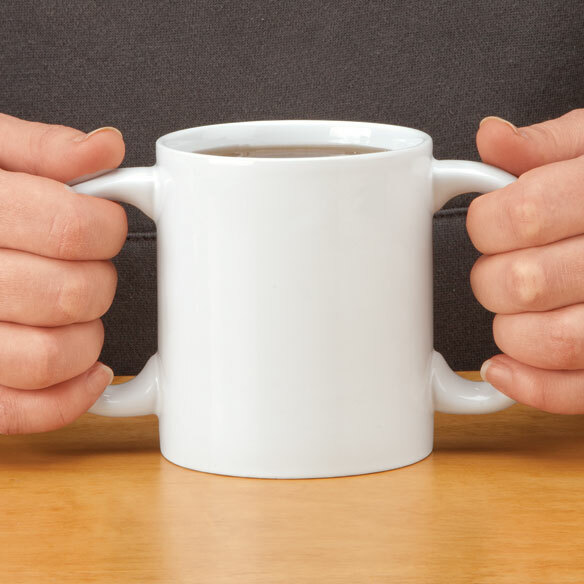 Two-handled mug provides comfort, stability and better control. Ideal for helping individuals with arthritis, tremors, or compromised strength drink safely and independently. Porcelain is safe for dishwasher and microwave. 11 oz. Have shaking ,this cup is wonderful!!! I bought this for my 96 year mother who has shaking problem. She can now drink her coffee by her self!! Wonderful. To pricey for one cup. Yes I used it. Very good and safe for shakey hands. For one cup it is too costly. Wanted to purchase more to give for gifts. At this price? Can't afford!!!! I bought 2 of these for a friend with Parkinson's disease. One for her home and one to use at my home. It's so much easier for her to hold than a regular cup. It was a great investment, she loves it. I use this mug for coffee every morning. My husband brings it to me and has one handle and I use the other. Keeps us from spilling contents. On the days my grip is not too strong I can use both handles for stability. I love this mug! I like this product for my arthritis wife. I have some neuropathy in my wrists and drop things at unexpected times. The two handles are a safety feature for me to enjoy hot liquids. Looks like it will be easy for me to handle, without having to touch the side (which could be too hot or too cold) to support it, and avoid a spill! An excellent mug for Parkinson's patients. For a client who has tremors.. Looks durable. I purchased this for the same reason,arthrtis in his hands.I thought this would make drinking easier for him. My husband has essential tremors and I think it will help him with his tea. Physical Therapist suggested one for my Mother. Mother didn't want to be the only one in the assisted living facility to have one so we got two extras for those who might also want one. I chose this cup because I have Parkinson's and I also have decided to get one for my sister who has tremors. I bought this for my girlfriend who has developed the shakes and has trouble drinking her favorite drink, coffee. I'm hoping this cup will keep her from burning herself. To keep from spilling hot liquids. As a safety issue for older adults. To help drinking with the symptoms of Parkinson's. Because I have arthirist and sometimes need help with my hands. I drop things alot and this is great to have. I have a daughter with spastic quadriplegic Cerebral Palsy, and the double handled mugs give her more stability holding it when she drinks! I have neuropathy in my hands. I thought this cup would come in handy. My brother had a stroke, and cannot hold onto a single handle well, 2 handles will help him hold onto it. I have weak hands and often spill my coffee depending on only one handle. I like the large handles on this cup that leave room for your hands. Excellent, thought out design. This has to make drinking coffee easier on arthritic hands and wrists. I have Parkinson's, and the one mug like this that I purchased has been a very big help to me. I'm purchasing two more. I picked this item because, the cup can be picked up by either the right or left hand. Is there a larger ounce mug with 2 handles? Thanks, but my coffee is 10 oz. With my shaky hands, I'd never get it back to the table. Looks like a tsunami when I walk. Would this be large enough for a man with large hands to get a good grip? BEST ANSWER: Thank you for your question. Yes the double grip mug will work perfectly. We hope this information will be of help to you.